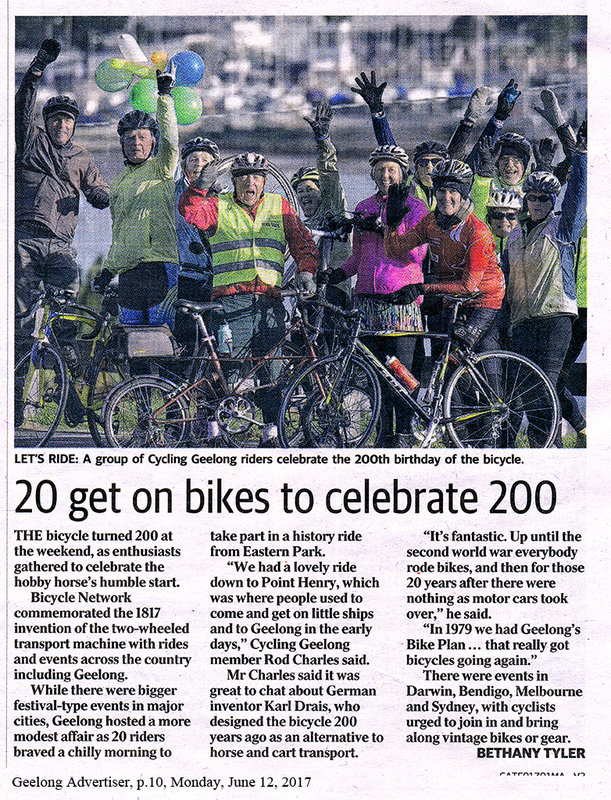 Although it was also a joint ride day, Rod had been invited by Bicycle Network to run a Geelong event to celebrate 200 years since the invention of the bicycle. The ride began in Eastern Park. Thirteen cyclists braved the chilly morning. 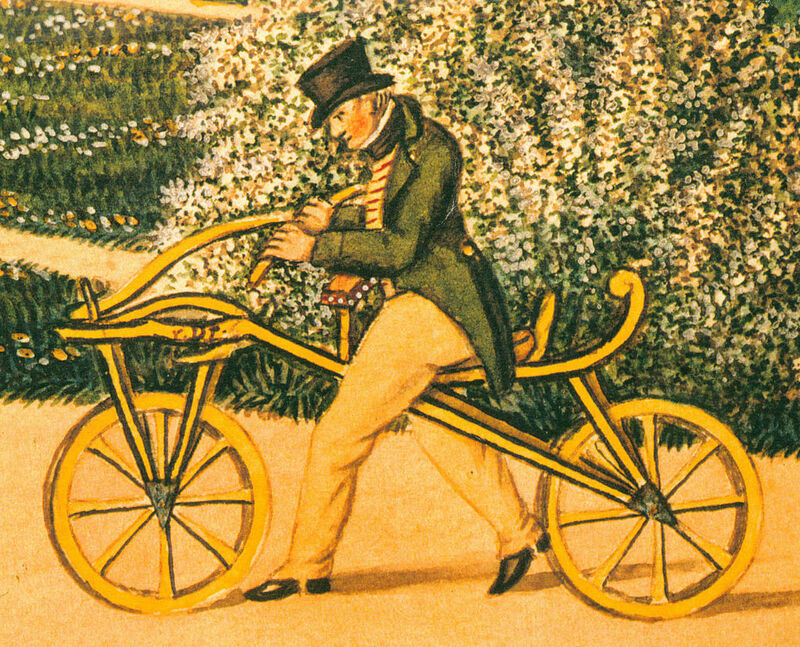 Rod explained that the first recorded 2-wheeled human powered vehicle was the running machine (laufmachine or Draisine) invented by Karl Von Drais in 1817. This had no pedals – the rider scooted and rolled. The machine was constructed of wood and iron, and the weight meant that only able-bodied men were likely to be users. As the roads were too rutted by cartwheels for easy riding, Draisine riders took to the footpaths – leading to the first conflicts between cyclists and pedestrians. Despite their weight, Velocipes (as they were soon named) were fast and efficient. The reaction of governments was to ban their use in several countries including Great Britain, USA and Germany. Today’s bicycles have firmly established the use of pedals for propulsion. 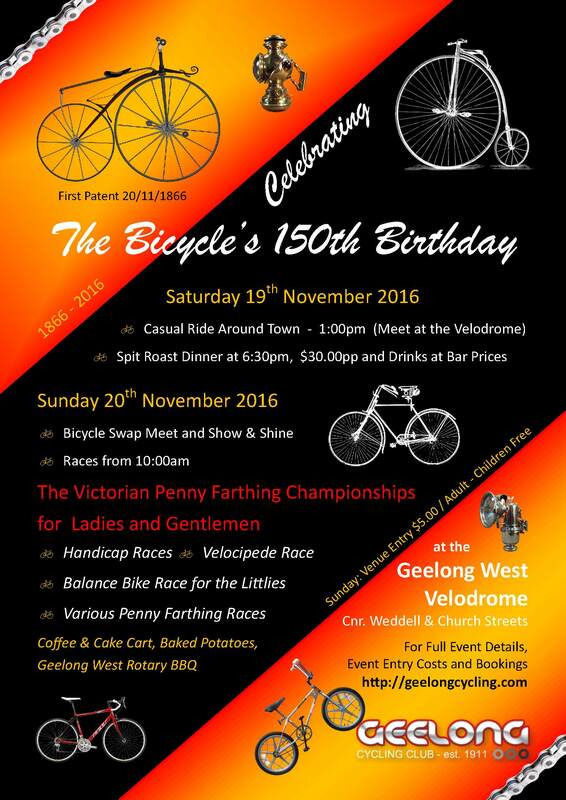 The oldest bicycle on the Cycling Geelong ride was a Gazelle, purchased some decades ago and ridden by Simon Watt. This bike is steel, and sturdy – 22kg, with front and aft racks. While in Amsterdam, adults are often be seen riding on the racks, Simon assured us that he uses his for transporting a crate of wine. The group heard more of the history of bicycles, and their use in Australia and Geelong whilst waiting for a photographer from the Geelong Advertiser. 3 degrees. Let’s get going! 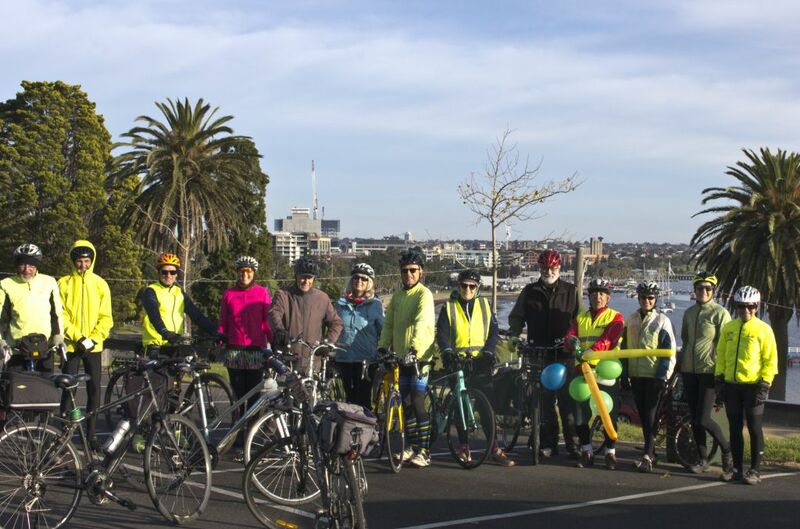 The group finally got underway along the new Eastern Beach bikeway to Point Henry. In early years Point Henry was a popular tourist and recreation destination. However, if one wished to ride through Eastern Park, it was necessary to dodge the many goats which grazed there. Thanks to Rod for once again running a most successful history ride. Keep your eyes open for news of our Seniors Month rides, when Rod will again lead the popular “History around the Barwon River” ride. Le Ride is the story of the 1928 Tour de France team led by Sir Hubert Opperman who, with Percy Osborn, Ernest Bainbridge, and New Zealander Harry Watson took part in what is widely regarded as being the single most difficult race of its kind ever. Of the 161 cyclists who started the race in Paris, only 41 made it the whole way back. Over 22 grueling stages, covering 5,476km, crossing the Pyrenees and the Alps, the race itself was enough to put a fresh team, many considered a joke, off competing. But after 6 weeks at sea getting to the South of France, their troubles started as soon as they arrived in Paris. Le Ride retraces the journey of the four Antipodeans, follows all the hardships they suffered, and puts into perspective how massive an achievement the gargantuan effort was. 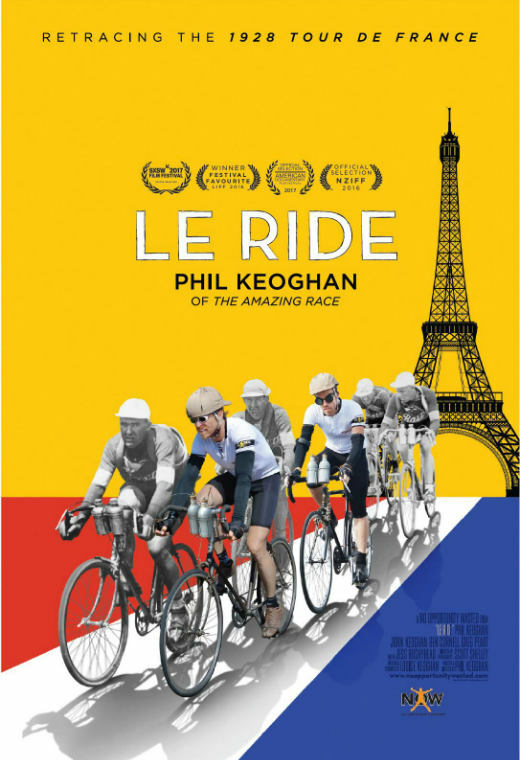 New Zealand TV personality and host of the American The Amazing Race, Philip Keoghan is a cycling enthusiast who retraced the steps of the 1928 Tour De France and documented the feat in this tremendously entertaining full length movie. The venue is again the wonderful Pivotonian Cinema in South Geelong and tickets are $20 each plus a small booking fee. Any profits will go to SAS (Support After Suicide) a new organisation set up to help families and others affected by suicide. See http://www.supportaftersuicide.org.au/ for more info. 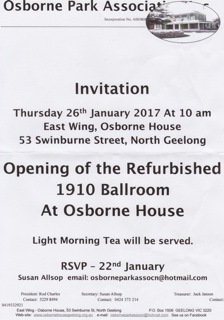 Rod Charles invites all Cycling Geelong members to attend the opening of the refurbished ballroom at Osborne House, Swinburne Street, North Geelong, on Australia Day (January 26th). Please ride your bike if you can! You’ll also be able to purchase Volume 3 of Rod’s book A Whirr of Many Wheels. Vintage bike collectors Pat and Robin Evans who attends Rod Charles annual Heritage ride is organising the event. If you want to help on the day contact them by email. The final volume of Rod Charles’s definitive history of cycling in the Geelong region is finally available. 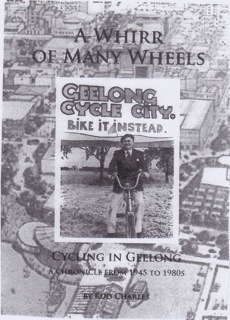 the history of cycling in Geelong, this time from 1945 to the 1980s the last of the trilogy Price $80 available from Barwon Booksellers (cash only) or from Rod Charles. Congratulations, Rod for this achievement. Rod’s history is far more than facts and figures about cycling. 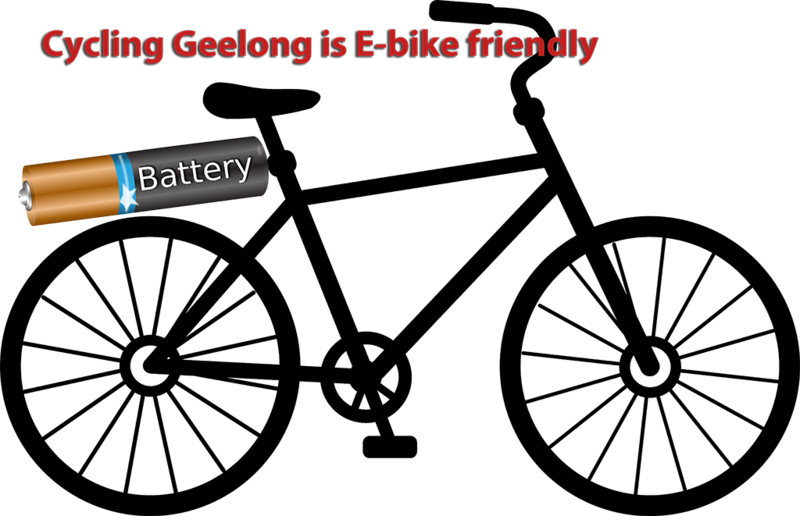 It follows the history of Geelong and the impact of the bicycle on that history. There are hundreds of historic photographs, documents and news reports to peruse.